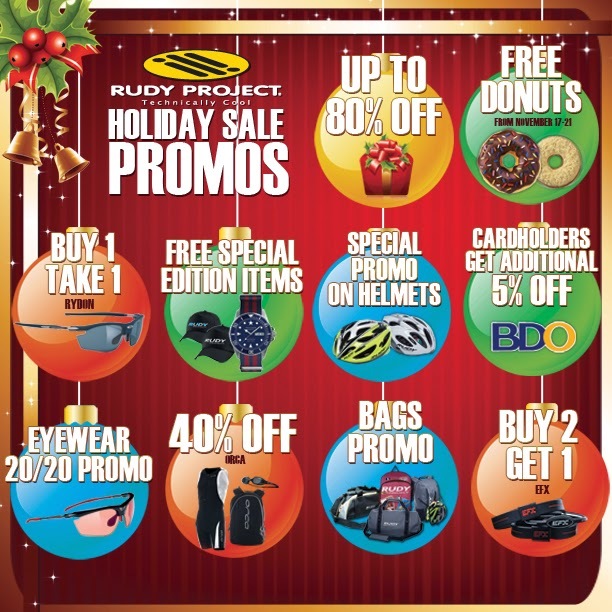 Rudy Project brings you its much anticipated Annual Holiday Sale! Right in time for your Christmas Shopping run, get your hands on the latest in Technically Cool gear with ridiculously low prices and jaw dropping deals! Mark your calendars for this huge sports blow out happening on November 16 to 21 at the Tektite Tower, Ortigas Center. A few Holiday Treats you can look forward to are: Free Special Edition items; Additional 5% off for BDO Credit Card holders; Free Gift Wrapping; Buy 1 Take 1 deals on Rudy Project Rydon Eye Wear; Free Donuts from November 17 to 21; 40% off on all ORCA items; Special Promos on Rudy Projects Helmets and Bags; Buy 2 Get 1 offers on EFX bracelets; and a 20/20 Promo on Rudy Project Eyewear! Enjoy Huge Discounts and get Big Savings in the best Holiday Sale in sports gear from a brand trusted by both athletes and sports enthusiasts. It’ll be a very Merry Christmas, indeed!